No sooner had the final whistle gone at London Stadium than the bookmakers were sending round the inevitable press releases stating Mourinho was the favourite to be the next manager to leave his job. The reality is if that scenario unfolds, it would fly in the face of the Glazer family’s ownership of Manchester United. While the reclusive American family, who never talk to the media about United, can be accused of many things, being knee-jerk is not one of them. In the immediate aftermath of their takeover in 2005, Sir Alex Ferguson was in the process of trying to rebuild his team, which had fallen well behind Chelsea and Arsenal. The Glazers stuck with him. David Moyes’ tenure was not brought to an end until United knew it was mathematically impossible to qualify for the Champions League, despite numerous awful results and even a plane flying over Old Trafford trailing a banner that demanded his exit. When rumours circulated around Christmas 2015 that Louis van Gaal was about to be sacked, they proved to be false. It was only at the end of the season when, once again, United had not finished in the top four, that he was removed. I was told earlier this week results would be the criterion Mourinho would be judged on. As bad as the defeat at West Ham was, I didn’t get the impression we were talking about one. Who is at fault – manager or players? Alexis Sanchez’s failure to score so far this season meant he did not even make the squad at London Stadium, with Anthony Martial replacing him in attack. Midfielder Paul Pogba – who was told in midweek he would not captain the team again following his comments that his side need to “attack, attack, attack” at home, and was then involved in an apparent training-ground dispute with Mourinho – was replaced on 70 minutes after an ineffective display. But it was in defence where there were most post-match questions. Midfielder Scott McTominay, 21, started as part of a three-man backline, prompting Scholes to question whether it is the quality of the players at Mourinho’s disposal – not just the manager himself – to blame for their poor run of results. Ferdinand, winner of six Premier League titles and the Champions League with the club between 2002 and 2014, agreed but also questioned the players’ attitude. “There is a lack of quality,” he said. “I’d question whether the players who have been brought in are good enough. But on top of that you have to get the players playing. I don’t see anyone shouting down people’s throats. There’s no intent to make life difficult for other players. 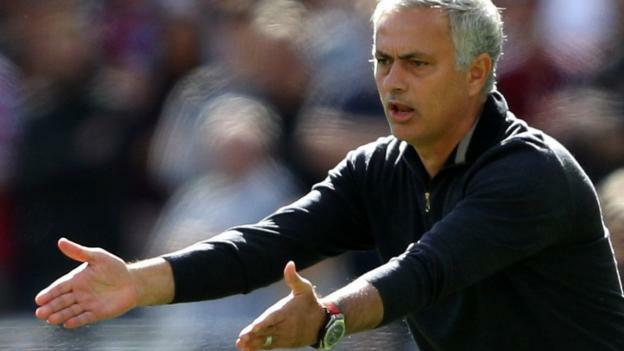 Mourinho said he could have “no complaints with the players’ attitude” but did question the quality of their play – as well as being unhappy with several of the officials’ key decisions. “When you come here and you feel the team, not shaking, but with a lack of confidence, it’s important to have a positive start,” he told BBC Sport. “We had the worst possible start, conceding a goal that was offside. The linesman made that mistake and we were punished. “After that we had a positive reaction. We had good situations but then we conceded a goal which was a bit ridiculous to concede. Everyone knows Andriy Yarmolenko is is left-footed. We had Nemanja Matic one-on-one with him, we had Lindelof and Shaw just after him, but we were not able to put pressure on the ball. These are things their central defenders did, and Pedro Obiang and Declan Rice in front of them fought to keep the clean sheet. “And then there was also another mistake, from the referee. Pablo Zabaleta pulls Rashford from behind, and their third goal kills it. “When you are winning and full of confidence it’s the best vitamin you can have. Sometimes you score impossible goals. What are Man Utd fans saying? Should Mourinho stay or go? And what about Pogba’s future? The Red Devils fans who called 606 on Saturday had some strong views. Ashley: “Mourinho and Pogba might have to go but Mourinho cannot go immediately. I think it sets a bad precedent if he gets kicked out due to player power. Graham: “Get rid of both Jose Mourinho and Paul Pogba. Get rid of them. If you get rid of one, the other will think they have the world at their feet. Ben: “I was appalled with what I saw today. It not a team, it is a bunch of individuals who can’t play together. They are nothing like the United of old. The team is chopped and changed every week. Scott McTominay is a good player but he was playing in defence. The spine of that team should be Eric Bailly, Pogba and Romelu Lukaku.